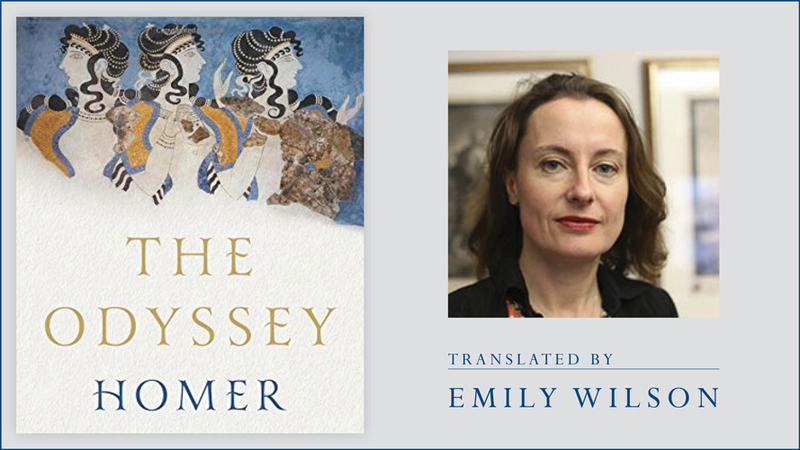 Emily Wilson, Professor of Classical Studies, is the first woman to translate Homer’s classic into English. We talked to Wilson, Professor of Classical Studies, about taking on the classic, one of the original texts of Western literature. Can you give the uninitiated an introduction to The Odyssey? The Odyssey is an archaic Greek poem, produced some time the late eighth or early seventh century B.C.E. Long time ago. It’s a 24-book epic in a mix of Ancient Greek dialects. It’s hexameter, which means there are six feet, or six metrical units, in each line. It tells the story of Odysseus after the Trojan War, how he was blocked from coming home by the anger of the gods, because the Greeks had violated the temple of Athena at Troy. The poem begins with Athena pleading to Zeus, saying, “It’s time for him to be allowed to come home finally.” Then it tells the story of how that homecoming happens. I think it’s surprising to people that the best-known part, Odysseus’ wanderings, is just the middle of the poem. Halfway through, he gets back to Ithaca, but he still isn’t home. So the poem is also addressing the question of “What is it to come home?” It might take longer than you think. It might not be about being in a particular place. In Greek, there’s a word, “nostos,” from which we get nostalgia. Nostalgia is the pain you have that’s associated with not feeling at home. It’s a poem of nostos. Why are The Iliad and The Odyssey so important? The Iliad and The Odyssey are the first texts in the Western canon. In Greco-Roman culture, absolutely everybody knew the Homeric poems. Alexander supposedly slept with a copy of The Iliad under his pillow. “I’m going to be like a Homeric hero” was something which emperors and normal people both had in their minds. Children learned to read and were educated in ethics by reading Homer. The Odyssey in particular had a huge influence on the development of the novel, because, unlike The Iliad, it’s a travel story. It’s a story which has a big impact on world literature as a story that’s about colonization, and about going to new places. What do you do when you come to new cultures? Why did you want to work on a new translation? I love Homer. I love the poem itself. I love all the different characters and perspectives. The richness of the role building in the poem, the rhythms of it, the language, and the whole mythological structure. I was excited about doing a translation because I felt I could do something different from what’s been done before. I’m the first woman to do a translation of The Odyssey into English, which is obviously a big marketing thing, but I think it’s also significant because I bring a gender awareness to this poem which is very much invested in, but also, questioning of androcentric values. It’s all about the Western male who’s getting back together with his objectified wife, and the whole center of the poem is the reunion that’s happening with the marriage. There’s the whole question of “To what extent are Odysseus and Penelope, his wife, on parallel journeys? To what extent is this an equal kind of relationship? Is there mirroring?” I think it’s very much not an equal relationship. It’s showing us all these different inequities that happen within the structure of the poem. Penelope’s journey happens entirely in her mind, in her dreams, in her tears, and in her bed, where she’s imagining whatever she can imagine but she’s completely constrained. She holds off her suitors by telling them she won’t remarry until she finishes a shroud for Odysseus’ father, then every night undoes the weaving she’s done during the day. Her work is all about undoing her own self. Whereas Odysseus’ work is all about getting somewhere. He’s constantly telling stories about how he makes the raft, he makes the bed, he makes the ship, he makes the Trojan horse. He gets places by his work. It’s a complicated story. It’s a complicated kind of hero. He’s not the only person who wants a homecoming, but he is the only person who, in this narrative, gets a homecoming. And his homecoming comes at the cost of everybody who doesn’t get a homecoming. It’s a narrative that tells you about the costs as well as the joys of coming home. You write in the introduction that the poem intertwines the story of Odysseus, his wife, Penelope, and their son, Telemachus, telling how something different is at stake for each of them. Can you elaborate? I wanted one to be able to have a sense of each of the characters as a real person. Fagles’ is the bestselling translation of The Odyssey, and he was praised when his translation came out for getting the women right, specifically for his treatment of the Ulysses-Penelope marriage. I personally think that he approaches the depiction of that marriage in very sentimentalizing terms. I wanted to bring out how Odysseus and Penelope have very different perspectives on their marriage and on life in general—that Odysseus has this idea that he can be the same person no matter what’s happened. Penelope is constantly articulating the possibility that you might be changed by circumstances, that her face is marked by tears, and it’s not going to change back. She’s not the same person that she was 20 years ago. The bad slaves are the ones who are willing to switch allegiances to a different set of owners—Melanthius the goatherd, who’s helping out suitors, and Melantho, the slave girl who’s sleeping with the suitors. Both those characters get killed in tortuous and sadistic ways in Book 22. It’s easy to have a sentimentalizing idea of what the family is in The Odyssey, and I very much wanted to avoid that. The family is a unit which involves all these different kinds of compromises and also hierarchies. I wanted to show that each of these people within the family unit, the oikos unit, are people, and I also wanted to bring out the ways that each of these people were allowed within the narrative perspective to see from each of their points of view. I hope that enables the reader of my translation to feel the pain when there is pain. Your translation is in a poetic meter. Most recent translations of The Odyssey haven’t attempted that. Why did you decide to go that route? My version of the poem is in iambic pentameter, which isn’t the same as the original rhythmically, but I think it has a very clear, audible rhythm. I aimed for it to be very easily comprehensible and speakable. I’m not trying to pretend that writing archaic English would make us any closer to the archaic Greeks. I wanted people to be able to have an immersive reading experience and be absorbed in the characters and what’s going to happen next. I wanted to have a sense that this is poetic language. It has a rhythm, it has a meter, it’s not the same as how everyone always speaks. Can you describe the translation process? I would say it was a constant process of frustration and difficulty. No two languages, no two cultures are ever alike. Translation brings you to confront the question of cultural difference. And to be aware. For example, I don’t have a word for a particular kind of female house slave, because luckily, we don’t have a particular kind of female house slave in our culture. Then what do I do as a translator? I have to convey something which suggests a “normal” kind of slave. The same kind of frustration comes up in pretty much every word, every phrase. Can works like The Odyssey be understood through a modern lens? Different cultural moments make it possible to read old texts in different ways, and in our particular cultural moment, some of the things I’ve been saying about violence and about the nonprivileged voices and characters within the poem, I think are much more visible now than maybe they were even when Fagles was sentimentalizing [in 1996]. I hope that the scenes of mass killing in Homer may take on a different resonance in our own awareness of the shockingness of slaughter that’s not on the battlefield. I hope we’re also much more attuned now to the issue of migrants and refugees. Obviously it’s a poem that deals with what happens when people are displaced from their homes, what happens when people are vast distances away from home and then trying to get home, dealing with cultural difference, ethnic difference. Do we have to figure ethnic difference as monstrosity? It seems to me that the poem sort of circles around that. How monstrous is the Cyclops, for instance, whom Odysseus robs and mutilates and humiliates—but Odysseus does get punished for it. Maybe we’re allowed to see both sides in that interaction. I do think my translation brings out the multiplicity of sides there and other places better than a lot of others have done. I think because I’m living in, writing in, thinking in my particular cultural context, I’m able to see things in this old poem which maybe weren’t visible before, and I don’t think that’s about imposing something on it that isn’t there. It’s about bringing something out in it. An example that has to do with gender is the scene where the slave women who’d been sleeping with the suitors are hanged by Telemachus. In all of the translations I’ve looked at, there’s abusive language in English that’s used in the translation of that scene. For instance, Fagles has Telemachus say, “You sluts, the suitor’s whores,” and he’s translating a line which literally means. “They slept with the suitors.” “They slept with the suitors” is actually not the same as “suitors’ sluts,” and the use of misogynistic language seems to me evidence of the way that a translation is always coming from its own particular ideological prejudices. I’m coming with my own particular cultural frameworks, political frameworks, and that’s the case for every single translation, including those which are praised for being very literal. I think there are ways that my translation is very literal or faithful or accurate, but I also find “What is it to be literal, faithful, accurate?” usually comes to a very simplistic way of reading. In one year, Sheila Murnaghan, Alfred Reginald Allen Memorial Professor of Greek, published a translation of Medea and books on the Beat generation and classics for children. During the 2016 presidential election, Saturday Night Live’s political skits became a regular feature on the Sunday morning news. SNL has continued to satirize President Donald Trump, who slams the show on Twitter in turn. Though the media are new, they’re continuing a tradition that is centuries old, and whose tropes and rules have remained strikingly similar across historical periods. Some years ago I wrote a comparative study of the Roman poet Juvenal and rapper Eminem to make that point.